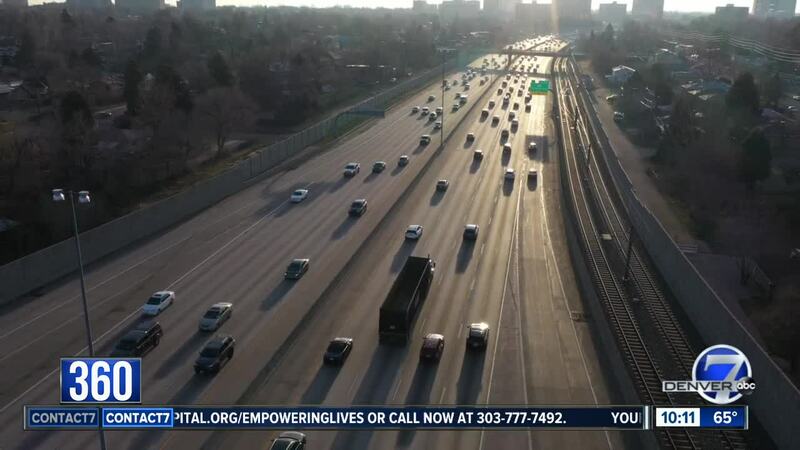 DENVER — If you're old enough to drive, you're old enough to have some opinions about the best way to merge into highway traffic. Do you turn your signal on and merge as quickly as possible? Or do you take the open lane all the way to the end? You may think that the driver is just being a jerk, but according to Colorado law enforcement officers, that driver is actually right. It’s called the zipper merge. For many of you, the daily commute is a constant battle. And you all know where that notorious choke point occurs. "It takes 20 minutes or an hour and a half just depending on the day," said one driver. "They get kind of cranky about it, too," said another driver. "Oh, that's very controversial,” said another Denver driver. “Zipper merging. You start a fight. It's almost political." If you don't know the term now, you will by the end of this story. The zipper merge is a controversial congestion management measure. In heavy traffic, instead of merging early before a lane ends, the zipper merge calls for drivers to exhaust the lane entirely, all the way to the choke point, and then fall in line one by one – just like the teeth of a zipper. "You use all available lanes up to the point where the lane is closed off," said Denver traffic cop Kurt Barnes. "Whether it's a crash, whether it's construction, you're supposed to utilize both lanes. It's safer for everybody," Luber said. "Exhaust the lane to its full use," Barnes said. Barnes says if you don't zipper merge you're causing two big problems. You could potentially cause a crash and by merging early, you're actually slowing down traffic already on the freeway. "Causing them to have to hit their brakes because you've jumped on there from a slow speed," Barnes said. “I talk about this all the time,” Luber said. “On TV, on my Facebook lives, on my podcast, I talk about it. It's so simple." Luber says even though the zipper-merge is a simple concept - hardly anyone is doing it. "Nobody will do it,” Luber said. “They just won't do it." Some drivers admit they feel more comfortable merging early. "I get over earlier if there's an opportunity," said one Denver commuter. "They don't zipper merge here which is the issue. But it's common sense," said another commuter. "Most people's nature is to move over as fast as possible and get out of that lane because they think it's the courteous thing to do," said Sgt. Chris Carleton with the Aurora Police Department. "It is safer because the concept is - all vehicles are traveling at the same speed," Carleton said. But, many view it as cutting in line. "Because they think they're cutting in line,” Luber said “They're not. They're actually doing it the right way. If everybody got on board, if everybody did it the right way, traffic would move a lot faster." And, in fact, studies show traffic moves 35-40 percent faster when drivers zipper merge. "The zipper merge is an effective way to merge,” said one commuter. “It keeps traffic flowing." While states like Minnesota, Missouri, Kansas, Washington and Colorado have launched multi-million dollar campaigns to promote the method, it is not the law. And not all states are all together on this. California, the unofficial car capital of America, maintains it's better to early merge - saying the zipper-merge is a recipe for rear-enders. And the Federal Highway Administration remains neutral on merging. But here in Colorado, law enforcement says zipper merging can take your commute from hell to harmony. "The idea is to fully utilize that entire lane. Take it as long as you can," said Barnes. "It's the right way to do it." "Even though you might get a couple of one-finger salutes," Luber said.